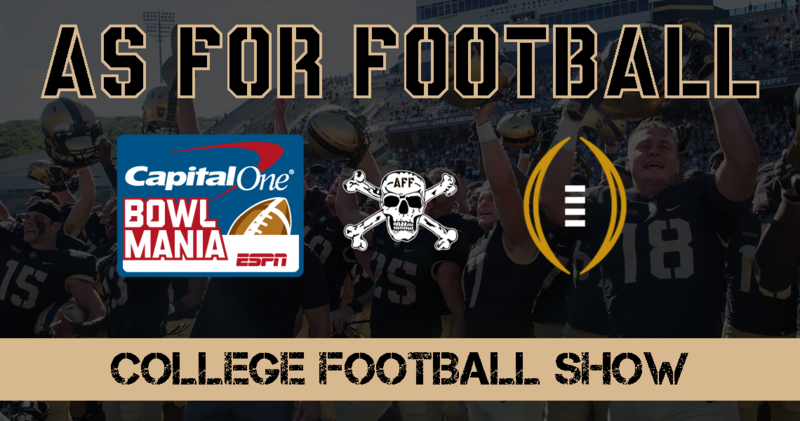 As For Football’s College Football Show with your host Rob Wright. In this episode we wrap up remainder of the 2018 Season with an emphasis on how Army’s Season impacted the landscape of College Football. Rob, Dan, and John update the results from the As For Football Bowl Mania Contest, react to the Major Applewhite firing, cover numerous post season accolades, discuss the final 2018 rankings, the promotion of John Loose, debate the importance of 2019 Preseason Rankings, the bias of the S&P+ Ratings, discuss the impacts to top tier programs following the National Championship game, and go over the favorite things of the week.